5 PINK DEPRESSION GLASSES 5 etched bands, sl. barrel shaped 4" high EXCELLENT! 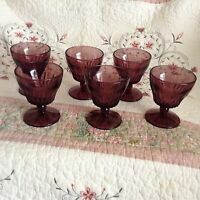 4 MOROCCAN AMETHYST Hazel Atlas GLASSES 4 5/16" Crinoline footed Stem Very Nice! 4 MOROCCAN AMETHYST Hazel Atlas GLASSES 4.25" Crinoline footed Stem Very Nice! 2 MOROCCAN AMETHYST Hazel Atlas GLASSES 4" Crinoline footed Stem NICE CONDITION! 1 MOROCCAN AMETHYST Hazel Atlas GLASS 5 5/8" Crinoline footed Stem NICE COND.